Smethwick West station opened in 1867 as 'Smethwick Junction' under the GWR on the line between Stourbridge Junction and Smethwick Junction itself where the line split between a branch linking with the LNWR's New Street to Wolverhampton High Level line and the continuation of GWR rails to mainline between Snow Hill and Wolverhampton Low Level. 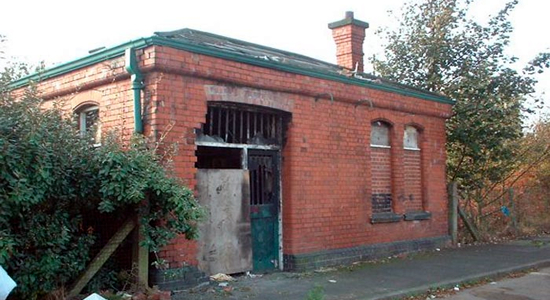 The station was to close in 1995 with the opening of the prestige Smethwick Galton Bridge station but an administrative blunder meant that the correct legal procedure for station closures was not followed thus the station had to remain open for a further year. However, in terms of service the station closed effectively in 1995 as for the last year only one train each way ran per week to satisfy the 'not closed' criteria! 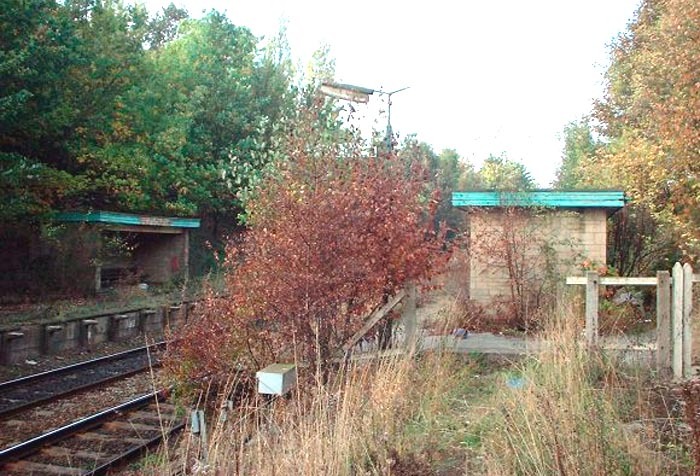 As it is a recent casualty of rail closure, the station itself is still in situ and is easily accessible. On my visit I discovered that the station entrance site on Sandfield Malthouse is now a Gypsy camp, the station building now surrounded by caravans. I was disappointed as I felt that my standing in the middle of their camp taking photos may lead them to believe I was a council official/journalist/etc . . . and lead to a non-too friendly encounter. Fortunately, a fellow webmaster and friend of mine visited the site recently and took some photos and has kindly allowed me to use them here. 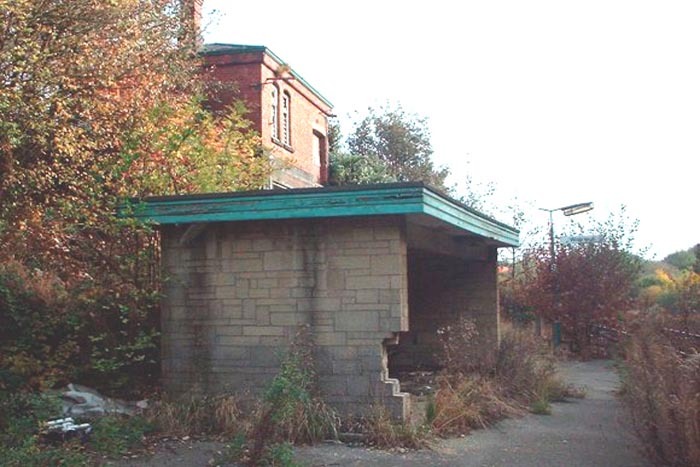 Above we see the station building on Sandfield Malthouse (photo: courtesy Paul Walker) and looking a little worse for wear shortly before demolition - the platforms lie in a cutting behind this small original GWR building. Above-left is the only photograph on the page taken by myself. We are looking at the station site from the Nineleas Street road bridge and looking in the direction of Smethwick Galton Bridge which is just around the bend to the left. On the right can be seen the link with the ex-LNWR Birmingham to Wolverhampton main line. Interestingly, for some reason the edging stones on the Stourbridge platform have been removed but not on the Birmingham platforms. 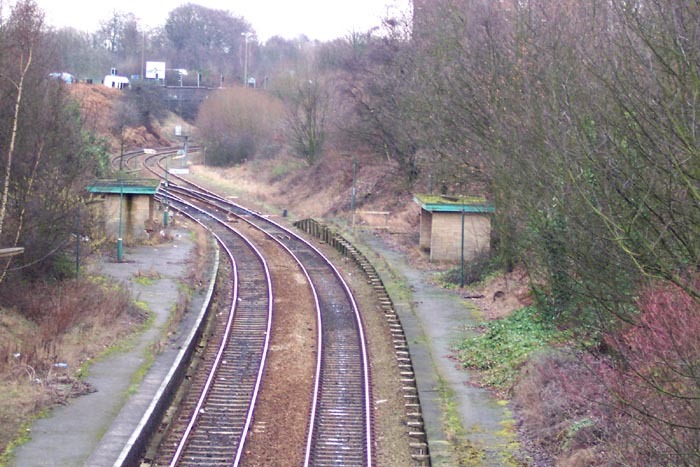 Above-right (photo: courtesy Paul Walker) we are on the Birmingham platform with the junction itself to our rear and looking back towards Langley Green and Stourbridge. The facilities here were minimal and are looking decidedly dilapidated. 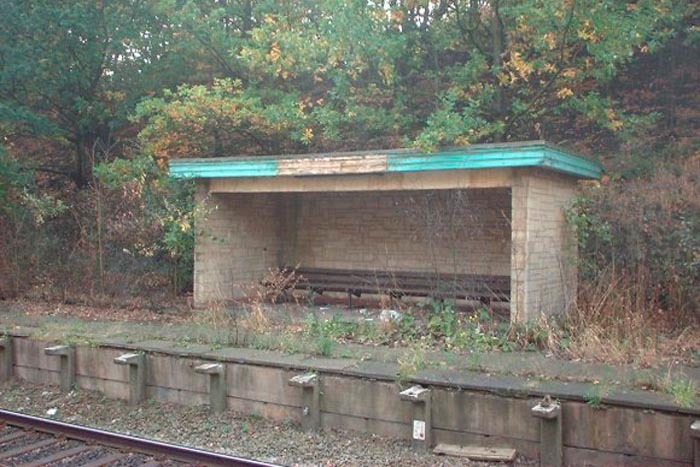 The brick shelters were products of the 1970s and originally on this platforms stood a larger shelter with a trademark GWR wooden canopy. Above-left we are still on the Birmingham platform (photo: courtesy Paul Walker) and get a good view of the crumbling shelter and this perspective also enables a good appreciation of the position of the station in relation to the station entrance building shown at the top of the page which can be discerned in this shot above the shelter. Above-right (photo: courtesy Paul Walker) we are on the Birmingham platform looking across the lines at the shelter on the shelter on the Stourbridge platform. It appears to be an interesting site for exploration but I would err on the side of caution until the temporary residents of the site move on. And thanks again for the pics Paul.